Step 1.) Start with blowdrying hair for added volume. You may also want to set hair with larger hot rollers. Step 2.) Take small, 1/2 inch section from front of hair. Twist slightly and pull to the pack and pin with hair pins. Step 3.) After all the front is pinned back, take very small sections behind the pinned hair. Twist each section then pin directly behind other sections. This will give height and mass to the style. And will also get you away from the headband look. When you have enough pinned up, use a curling iron to control any hair sections that look out of place. Spray with hairspray. Then flip the back bottom hair up. 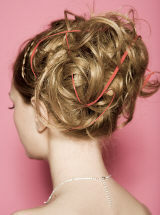 Take another hair or bobby pin and place into the section from the back, pointing towards the front. This will give the section height.pins. Continue to do this to the front sections of hair.